There is general misconception among people that by avoiding ‘plain sugar’ they can prevent themselves becoming a diabetic and take care of their ‘sugar’ level in the blood. The concept of glycemic index & glycemic load will help you understand this and everyone needs to be conscious of the importance of this in our daily living. 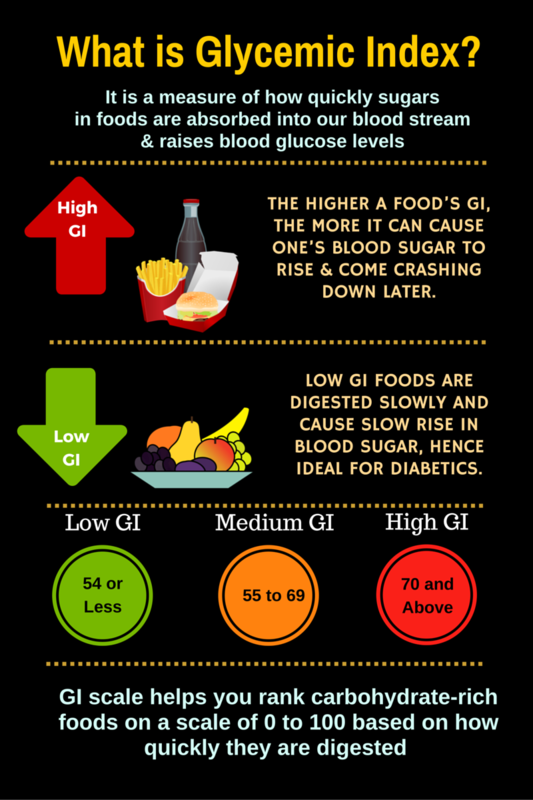 Glycemic Index (GI) & Glycemic Load (GL) are determined to help people with diabetes manage their blood sugar levels and maintain their health. Low GI foods help you manage weight and reduce risk of developing type 2 diabetes. The rise in blood sugar of carbohydrate containing foods have a similar response to the insulin in the body. Most of the time, GI is being used as a guideline for making dietary recommendations for the people with diabetes or hypoglycemia. People with blood sugar problems should restrict themselves from foods with high values and chose carbohydrate containing foods, which have lower values. However, the glycemic index should not be the only dietary guideline. For example, high–fat foods, such as ice cream & sausage, may have a low glycemic index, these foods are not wise food choices for people with diabetes or hypoglycemia. Use those tables of Glycemic Index, but don’t use them to construct a healthy diet.